As part of what one of our managers described as “a bull market in fear,” 2012 was a year in which central banks around the world ganged up against savers and forced them to choose between monetary debasement and navigating a minefield trying to escape it. Asset classes largely manifested those two extremes and investors who attempted to diversify around asset classes experienced the full brunt of that market volatility. This was better known as the ‘risk on / risk off’ investing environment that vexed most investors. 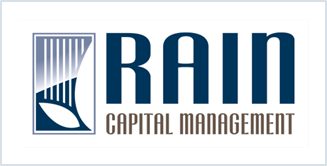 Rather than participate in the unpredictable ‘risk on / risk off’ world, RAIN portfolios spent much of the year in Low Correlation Growth and Low Correlation Defensive strategies, segments of portfolios that are less directly correlated to equity and bond markets. 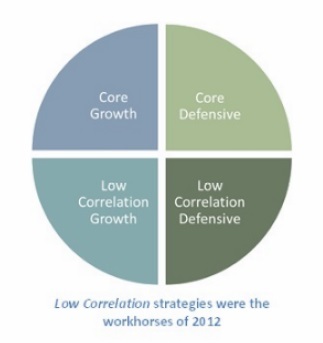 In Low Correlation Growth, we focused on strategies that are designed to do well in changing credit, liquidity and volatility conditions, but not necessarily strongly tied to the direction of equity markets; in Low Correlation Defensive, we focused on strategies designed to deliver bond-like returns and safety, but whose performance drivers may be independent of interest rates or credit spreads.